Early last week we were inundated with small gray moths. You couldn’t open a door without two or three coming inside. Moths inside are cool for Izzy, Maddy and the cat – all like to play with them. One evening, at dusk, Maddy took her bug cage and went out on the deck. In about 10 minutes she was back with a cage full of moths. My curiosity piqued, I went downstairs to Google “little gray moth” to see if I could put a name with the fuzzy little face. Next I heard a grownup “wow” coming from upstairs. My wife appeared at the bottom of the stairs. “I just saw a little gray bird fly or jump from the dogwood tree to one of the big trees and back,” she said. I went upstairs to look and there, perched in the dogwood, was an eastern screech owl. Sitting on a bare dogwood limb framed by the dim twilight the owl looked elfin. It soon launched itself to the side of a large locust, then back to the dogwood; then to a grapevine and back to the dogwood. After a couple more of these sorties, I realized the owl was feeding on the moths. We called the kids in and for 15 or 20 minutes Izzy, Maddy, Mom and I watched as the little owl tracked moths, then launched itself to tree, or branch, or grapevine in pursuit of the tiny morsel and then returned fly-catcher like to its perch in the dogwood. While the owl appeared gray in the dusk, a look through binoculars revealed that it was a red-phase bird. Now there were two mysteries. What was this little moth engulfing our home and enticing screech owls and how common was this fly-catching behavior? I quickly realized I was in over my antennae trying to Google this moth. Do you have any idea how many different little gray moths there are in the world? So I decided to rely on the “old fashioned” way of seeking information – I asked someone smarter than me. Paul Super science coordinator at the Great Smoky Mountains National Park’s Appalachian Highlands Learning Center at Purchase Knob identified the moth as Eupithecia sp. – common name pug. He noted that it is very difficult to separate the different species of pugs. Super said there were at least a dozen species of pugs in the Great Smoky Mountains National Park and the most prevalent by far was the common pug, E. miserulata. This tiny gray moth has a wingspan of less than an inch. The grayish wings have small disc-like black dots. The common pug ranges from Florida to Nova Scotia and west to Texas. There is also a western population in California and Washington. It overwinters as a pupa, probably accounting for its early spring flight. As for screech owls catching bugs, it seems insects are a large part of this little character’s diet. 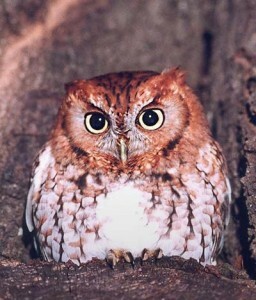 During a 1927 study in Nebraska eight screech owls were dissected. Those stomachs contained 210 locusts, 2,757 other insects, 2 mice and 1 bird. All anyone has to do to learn something new in nature is pay attention.